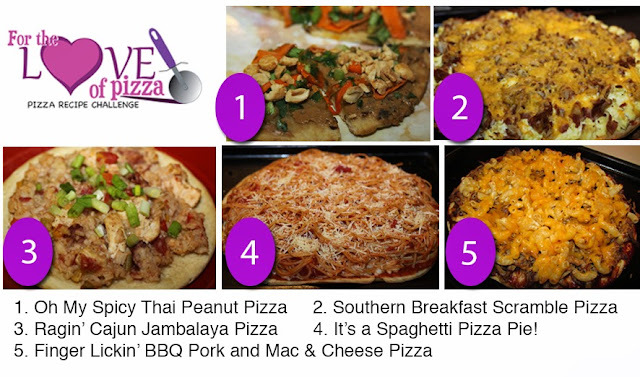 For the Love of Food: Ragin' Cajun Jambalaya Pizza and a Mama Mary's Giveaway! Ragin' Cajun Jambalaya Pizza and a Mama Mary's Giveaway! It's Day 3 of this fun Recipe Challenge and Voting Contest with Mama Marys Gourmet Pizza Crusts! Once a day this week I will post five fun "out of the box" pizza recipes using Mama Mary's Pizza Crusts. Simply scroll to the bottom of this post and vote for your favorite and enter the contest below! One lucky reader will win a $100 VISA gift card and VIP Product Coupons for Mama Mary's. Living in Louisiana, I have tried my fair share of Cajun food. Some good, some downright scary! But one thing's for sure: Cajun and Creole food sure is flavorful! So I knew I wanted to make a fun twist on a Cajun classic and make it into a pizza! I decided on Chicken and Sausage Jambalaya because it is loaded with ingredients, full of flavor, but also nice and moist so it wouldn't dry out on the pizza. Then I added a Old Bay Butter to my Mama Mary's crust to bump up the flavor even more! Hope you give Cajun a try and make this recipe at home. Let me know what you think! Come back tomorrow for the next recipe- It's a Spaghetti Pizza Pie! Garnish with diced green onions and hot sauce! Heat a Dutch oven or deep pot over medium-high heat. Add sausage and sauté until browned. Add onion, celery, bell pepper, (known as the Trinity!) and garlic and sauté 6 minutes or until tender. Mix in rice, broth, 1 tsp Old Bay, and 1 tsp thyme and bring to a boil. Cover, reduce heat, and simmer 20-25 minutes or until rice is done. Stir in tomatoes and chicken and add hot sauce and salt and pepper to taste. Cook, stirring, until thoroughly heated. Mix together melted butter and 1/4 tsp Old Bay. Brush onto 2 mini Mama Mary's Pizza crusts. Add 1/2 cup cooked jambalaya to each crust and spread to cover. Bake for an additional 7 minutes. Remove from oven and top with diced green onions and hot sauce (optional). Serve hot and enjoy your Cajun Pizza! I love the Cajun heat from the Andouille Smoke Sausage! When you are heating it in your pot the whole kitchen fills up with a warm, spicy smell and you know you are cooking a Cajun dish, y'all! Onions, bell peppers, and celery are known in Louisiana as The Trinity. It is in most Cajun dishes such as Gumbo, Etouffee, and of course Jambalaya! Add The Trinity and minced garlic to the pot and cook down. cooked and most of the liquid is absorbed. I had two large chicken breasts and I simply poached them (simmered) in chicken broth. Then I chopped them up. It was about 2 cups of chicken. Once the rice is done and most of the liquid is absorbed remove the lid and stir. Mix in one can diced tomatoes, with liquid, and 2 cups chopped chicken. Add hot sauce and salt and pepper. Stir until heated, about five minutes and you have your self a good lookin' Jambalaya! I always top my Jambalaya with crunchy green onions and extra hot sauce! Big chunks of chicken and sausage make for a hearty and tasty dish! Baby Ava loves being in the kitchen and watching all the action when I cook! To decided to keep the crust moist and add an extra kick I would make an Old Bay Butter! Simply mix together melted butter and 1/4 tsp old bay. This is enough for 2 mini pizza crusts. Brush Old Bay butter onto two mini Mama Mary's pizza crusts and bake for 2 minutes on 425 degrees. Spread 1/2 cup Jambalaya on each mini pizza crusts and bake for an additional 7 minutes at 425 degrees. Remove from oven, top with diced green onions and hot sauce and serve hot! Looking so yummy... mouth watering recipe of Jambalaya Pizza..
Ragin' Cajun all the way--yummmmmmmm! Anything Thai is a winner! I love the idea of spaghetti pizza pie! Can't wait to try it!